I understand that when compared to other genres that those falling into the comedy classification don't really compare no matter how funny or enjoyable they are, but because they are more exercises in pure entertainment than trying to convey raw emotion or serve a bigger purpose. They don't look to teach us anything or expand our minds necessarily and they rarely offer anything innovative when it comes to the world of filmmaking, no, all a comedy really wants to do is make us laugh and while it may seem more admirable to adapt a historical figures life for the screen or create real substance for a man with a cape I'd argue it is probably tougher to make people consistently laugh at the jokes you're spewing. Unfortunately, much of the time the end result proves that and so we don't often get comedies that we feel really connect with a majority of us because 1) humor is extremely subjective and 2) jokes aren't easy to write when you sit down and have to think about them. When looking at the Anchorman films and the group of people collaborating to put these together it becomes clear why they may have more of a pulse on the eclectic tastes of audiences and that is simply due to the spontaneity of it all. There is a freshness to it that doesn't feel forced, no pre-determined jokes that fall flat in execution, but instead just a few master improv artists hanging out, gathering around a central idea and then growing off of it until it reaches ridiculous and often hilarious heights. So, I understand that while most don't consider comedy one of the higher art forms and that films like Anchorman, much less its sequel, don't make critics top ten lists or are hailed as great films for how funny the absurdity of it all is, but the fact of the matter is that I laughed more at Anchorman 2: The Legend Continues than any other film this year and while that still may not be enough in many peoples eyes to verify it as a "film" rather than just your typical mainstream comedy, this is one of the few times in recent memory when upon going into a film with such high expectations that I came out and without any inhibition was able to say that it more than lived up to what I hoped it would be and in many instances, even surpassed it.Yes, in many ways this is better than The Legend of Ron Burgundy, but that is only because it is the continuation of a legend and as I'm sure Mr. Burgundy would attest, "How could it not be MORE legendary?" in Anchorman 2: The Legend Continues. Picking up a few years after the first film left off we meet Ron Burgundy (Will Ferrell) and Veronica Corningstone (Christina Applegate) at the dawn of the 80's as they co-anchor the World News Center desk together in the weekend slot. They are married, living in New York, have a now 7 year-old child together, Walter (Judah Nelson), and are both living out their dream. What could go wrong you might ask? Well, when their boss decides to fire Ron for being the worst anchorman he's ever seen and offers Veronica the position of lead anchor on the nightly news a wedge is driven between the couple as, in perfect Ron Burgundy fashion, he gives Veronica an ultimatum which, in short, results in him hosting shows at Sea World three months later. Things don't go so well for Ron over at Sea World either and it's not until he is approached by Freddie Shapp (Dylan Baker) who is recruiting for a new kind of news channel that Ron sees a purpose in his life continuing. He takes Freddie up on his offer of working at the Global News Network or GNN, a channel that will offer the first 24-hour news cycle, and is given free reign to pick his own news team which of course means we need to catch up with Burgundy's old pals from the Channel 4 squad. As we are re-introduced to Champ Kind (Dave Koechner), Brian Fantana (Paul Rudd) and Brick Tamland (Steve Carell) each scenario each feels suspiciously close to what I imagine the discussion was like with each actor to return for the sequel, but that doesn't really matter for they are each as outrageous as we'd hope and top the short little monologues each delivered in the first film. This brings us around to the other important point to be made about the story: there is one and it doesn't simply play off the beats or jokes of the first film. While The Legend of Ron Burgundy was slim on narrative until it finally decided it was somehow going to have to come to a resolution The Legend Continues is driven by its story from the very beginning. Does it stray from the main plotline a time or two and does it meander a little in the second act? Sure, but it never stops being funny, it just turns out to be a little more unexpected than anything else and that is far from the worst quality to have when being a sequel to the biggest comedy of the last decade. What does indeed drive said plot is the presence of strong satire and in a genius piece of writing allows the most offensive, politically incorrect goof on the face of the planet to come up with what many now refer to as the death of quality news reporting. It is made clear time and time again that Ron Burgundy is not really a good person, he doesn't care to be a good husband or good dad he simply wants to be well renowned as an anchorman and if he doesn't really have to do much to achieve that status he's fine with that too. The catch is, people still want to see him succeed and he is able to get away with his inappropriateness because he is such a moron which in turn leads to him being more of an endearing character on screen than he might be if we were to actually have to deal with a person like him in real life. 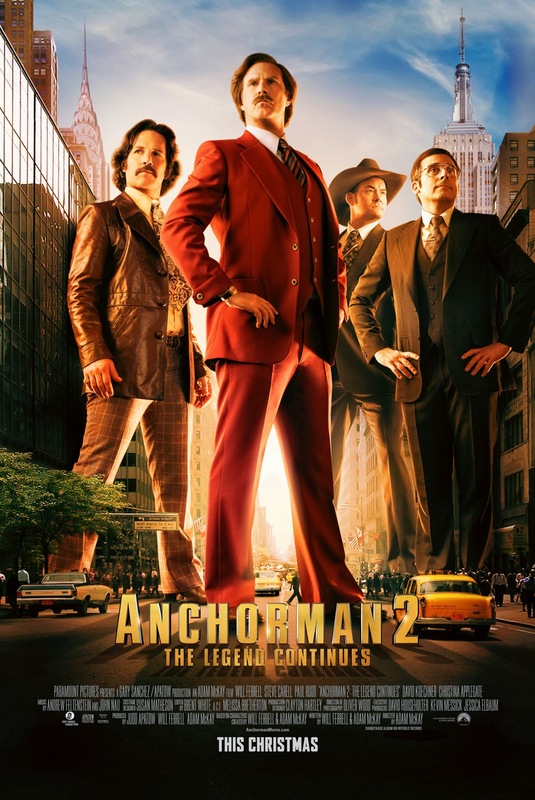 It is clear that long time Ferrell collaborator Adam McKay (who directed and co-wrote the script with Ferrell) understand what they have on their hands here and are smart to execute what is absolutely politically incorrect and transfer it through these characters that somehow make the bits come out okay, and funnier than we would like to admit. The brunt of this comes from Ron dealing with the fact his new boss, Linda Jackson (a solid Meagan Good), is a young black woman with attitude. Not only is she African American, which both Ron and Champ throw so many stereotypes at it's insane, but she also has the female factor and a drive that frightens Ron when she comes onto him sexually. If you've seen the trailer you've seen a clip from the dinner table scene where Ron sticks out like a sore thumb and doesn't assimilate in the ways he thinks he is by trying to "act black". It is the epitome of a wreck you can't look away from and it is in that essence that McKay and Ferrell display their understanding not only for the characters, but of their comedy and how the melding of the two to produce not just something that will make you chuckle and not think twice about it, but instead something of a nice if not so subtle jab at culture, at the actions of human beings, at ignorance but ultimately just making fun of those not wise enough to learn and think before they speak. What do you know? Maybe they are able to create something with at least a slight bit of substance, no matter how silly of a comedy this actually is. 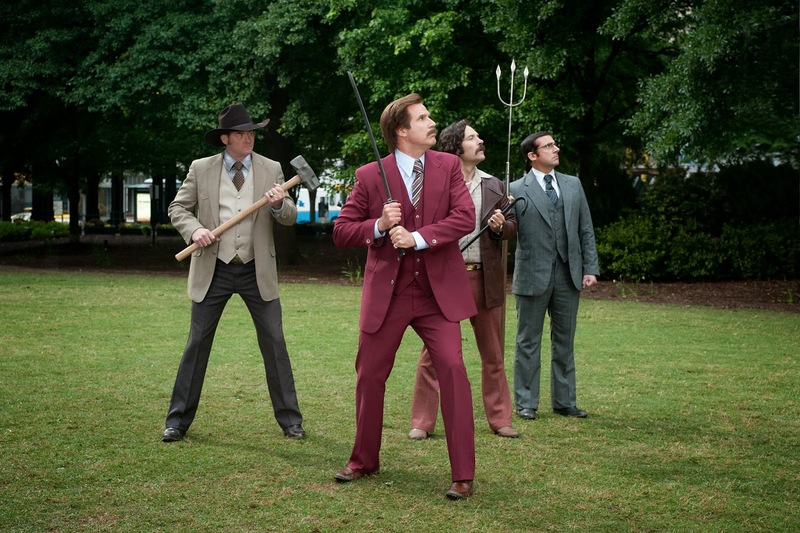 Ron Burgundy is joined by Champ (Dave Koechner) Brian (Paul Rudd) and Brick (Steve Carell). I was seventeen in the summer of 2004 and could not have been more happy to go see The Legend of Ron Burgundy multiple times with different sets of friends and family or watch it again and again after purchasing it on DVD that Christmas, but I never expected it to leave the cultural impact it has created since. Now, almost ten years later I never thought a sequel would be able to live up to the mythology of this news team no matter how sub par or scatterbrained the original film might actually be when taken on pure storytelling and filmmaking terms. Still, what The Legend Continues does best is to create its own mythology, not afraid of breaking away from the city or certain constraints many filmmakers and actors might feel pressure to re-visit in a sequel with as many avid fans as this one. What has always made Ferrell a broad and lovable comedian is his willingness to be out there, to go for it, all or nothing and all I could have hoped for with Anchorman 2 was that they kept the level of ridiculous and random as high as they did in the first film no matter what scenario they placed the characters in and that was done with much bigger scope than I could have come up with myself. While the focus of the film is kept on track for the most part by the backbone of the 24-hour news cycle it is when the film goes off on its weird little tangents that we get some of the funniest material and likely the lines that will be quoted more often than not. When Ron takes a leave of absence and re-discovers the meaning of life in the most ridiculous of ways we don't always laugh because of how it plays out but because of the way Ferrell as Burgundy reacts to the situations at hand as they turn in nothing short of comedy gold. It is more than out of left field, but it is hilarious and it keeps us laughing while subtly playing at the tropes of countless other films before it. Brick also gets a subplot concerning his odd love life after meeting the equally befuddling Chani (Kristen Wiig) as the two of them go to dates together and grab a few drinks out of their favorite soda machines. It may not always be pertinent to the main narrative, but it re-enforces why we love these characters so much and provides ample opportunity for the actors to shine as everyone here seems to be having a great time. Carell really goes for it with Brick and nearly steals the show multiple times while Rudd is as smooth as ever if not slightly under appreciated as is Koechner's timing. It is impossible to know if The Legend Continues will leave as much of a mark as its predecessor as only time will tell if we quote it as regularly and in turn use those quotes as a point of community and shared love of all things ridiculous, but I loved the film and I had every reason to be cautious going in. Anchorman is that film that came along at the critical point in my high school experience and defined what my friends and I laughed at and how we tried to accomplish comedy in our own lives. We came to appreciate the ridiculous rather than the comedy patterns of those that had come before and we hailed the master that Ferrell is in the years to come as he gave us Ricky Bobby and a couple of step-brothers. It is a stamp on that period of my adolescence that will never leave as I have a soft spot for comedy in my heart anyway and so to know that all of those silly, but personal feelings stood the chance of being tampered with by a sequel was slightly scary. The fact that these guys didn't simply throw together the same cast and rehash the same jokes for a quick cash grab (I mean, they did wait ten years, the anticipation was killer as well) was enough to make me happy, but that they dared to try something different, that they took what they learned over the course of making three other films together and applied them here to make the film a better overall experience and of a higher quality speaks volumes to the audiences that will flock to see it and rather than tarnishing the legacy that Ron Burgundy established in 2004 have built it up even more; giving original fans a source of pride while making a new film that will garner a whole new generation of Ferrell and Anchorman fans. I really did love it and even if you don't that is fine, I'll try to understand, but at the very least you will love Doby.